"Germany Sets New Record, Generating 74 Percent of Power Needs From Renewable Energy" trumpets the headline of a recent article in CLIMATE PROGRESS. In the first paragraph of the story, we are told that this event adds to "Germany's impressive streak of renewable energy milestones." The date of the article is May 13, and refers to the milestone occurring "on Sunday", which would have been May 11, 2014. Wow! 74 percent! If this has you scratching your head, try to reconcile it with the first statement of the next paragraph: "In the first quarter of 2014, renewable energy sources met a record 27 percent of the country's electricity demand." But on second look, we see that the whopping 74 percent came from the renewable contributions in the middle of that particular day. That is, May 11. Let's take a baseball analogy: Joe Schmoe, batting .270 for the first 50 games of the season, goes 3-for-4 in the 51st game, and the headline reads "Schmoe batting .750!" (Would the headline read "Schmoe batting .000!" if he went 0-for-4 in his next game?) This is the type of partial truth with which renewables enthusiasts cook the books. Wind turbines and transmission lines in Nauen near Berlin, Germany. The disparity between the 74 percent claim that sounds so exciting, and the more prosaic reality, is typical of the distortions emanating from renewable energy cheerleaders. Their enthusiasm is understandable—there's a lot to cheer about—yet it can lead to wild interpretations of the facts. There is no way of knowing, without more than one data point, how great the variation in renewable generation is from day to day. We can assume that the 74 percent is unusual, or the article would not be But negative prices evidence oversupply, which threatens instabilities of voltage and/or frequency. Those instabilities have impacts on the operation of motors and computers and other electrical gadgets. There have to be means to dampen spikes, or waste the excess generation altogether (what is called "taking a curtailment" among Transmission Service Operators in Europe). In practice, the ballyhooed 74 percent figure creates just as big a potential problem for grid management, and for pricing, as does undersupply. In principle, there are ways to deal with the swings in electricity generation from renewable sources. They are complex or expensive—often both—and will be discussed in later articles. The simplest and least expensive solution is to limit the contribution of highly variable inputs—wind and solar in particular—to a manageable fraction of the total. It's the current status quo. The status quo results from the incontrovertible necessity to meet base load, and also to have reliable reserves to call upon, not just when they happen to be available, but whenever they are needed—in industry parlance, "dispatchable" power sources. It's a status quo that delivers reliability, giving heart to the champions of fossil fueled power generation, who chant the mantra "affordable and reliable" at every opportunity. To range far from the status quo hazards a bet that only pays off if it substantially lowers CO2 emissions. However, it is a bet that has, to date, failed to make a significant dent in CO2 emissions in the country that has most loudly proclaimed a strategy to do just that—Germany. For real-world practice, we turn to Germany's track record, as compared with that of France, for the period 2005-2011 in regard to CO2 emissions, and 2005-2012 in regard to electricity production. In both cases we will take data from the U.S. Energy Information Administration (U.S. EIA). Comparing France is relevant, because the two countries are very similar in population, geographic size, and level of industrialization. Of course the two countries differ widely in use of nuclear power. During the period in question, both countries reduced nuclear power production, but Germany's plunged by 39 percent versus France's 6 reduction. The EIA does not yet have published data on CO2 emissions for 2012-2013, nor for generation after 2013. We do know that Germany's replacement of nuclear with renewable sources has accelerated recently in the much-publicized "Energiewende". However, Germany's expansion of generation from renewable sources, together with closing nuclear power plants, is nothing new. It has been growing apace since the passage of the German Renewable Energy Act of 2000. The ongoing trend is evident in a chart published earlier this year in TriplePundit (note the period 2005-2012). While renewable production was ramped up from 2005 to 2011, CO2 emissions from coal burning and natural gas combined dropped from 500.99 million tons to 442.43, a decrease of 11.7%, in Germany. Taking a population of a constant 81.4 million people (it's not constant, but in Europe populations don't change much in six years), we see a drop from 6.15 tons per capita to 5.44 tons per capita. That's impressive! France's comparatively low rate of carbon dioxide emissions from coal and natural gas stems largely from France's reliance on nuclear power for generating electricity. In 2011, France produced 79.2 percent of its power from nuclear, according to the EIA (some estimates peg it as low as 75 percent depending on how you count exports, but you get the picture), and 8.4 percent from fossil fuels. By 2011 in Germany, nuclear was at 18.2 percent, and fossil fuels, 60.0 percent. Germany's downward trend in CO2 emissions from coal and gas looks promising. But here's where things get complicated. In fact, a big chunk of Germany's "renewable" energy really isn't all that renewable, even though the CO2 it releases is not officially counted as emissions. Biomass emissions are not counted, and biomass burning tripled during this period. Biomass emissions are not counted because it is believed that, since plant growth takes CO2 out of the air, burning the carbon in plants is carbon-neutral in a cyclic process. Therefore, we can expect biomass burning, as actually practiced, to produce a net gain in CO2 emissions, on the coal-burning order of magnitude. In 2012, we don't have figures for emissions, but we do have 2012 figures for generation, where Germany from 2005-2012 cut their fossil fuel generation from 62.5 percent to 59.7 percent as a fraction of net generation from all sources. This represents a 4.5 percent relative reduction over seven years. In the same seven-year period, France went from 10.6 percent down to 8.2 percent—a 22.6 percent relative reduction. While it's not fair to generalize from a seven year span, on account of economic factors, it's safe to say that Germany, despite its crash renewables program, is not reducing its fossil fueled production much better than France—if at all. Even allowing for improvements in efficiencies in coal-burning, and the fact that generation does not correlate perfectly with emissions, CO2 emissions in Germany are not in sharp decline. But when you get to burning biomass in the form of wood, the emissions picture gets bleaker. The accompanying charts on net generation from fossil fuels together with biomass show that, in terms of combusting carbon to produce electricity, Germany went nowhere between 2005 and 2012. While we don't know how much net CO2 is being added to the atmosphere with biomass burning, we can be very sure it's well above zero. If total CO2 emissions actually did go down between 2005 and 2012, the reductions could not have been as great as the official 11.7 percent drop in emissions. The "renewability" of biomass burning is a matter of faith, and many experts have found this faith to be extremely shaky. The hard truth is that little is understood about how land-based carbon sinks work. To what extent could they actually pull enough carbon dioxide from the atmosphere to offset carbon emissions from biomass burning? Since roughly a third to half of CO2 emissions remain in the atmosphere, according to ground-based measurements, there's cause for serious doubt. To investigate this question, you could start with a piece in Science 2.0: here. (If you lack confidence in Science 2.0, you will find similar analyses elsewhere.) Note that the article's quote "photosynthesis is greater then decomposition" does not amount to saying photosynthesis can keep up with biomass burning on a meaningful time scale, since burning is much faster than natural decomposition. If photosynthesis begins to overtake emissions from biomass several decades from now, that's too late to arrest many of the worst effects of AGW. In the meantime, increased wildfires consequent upon AGW are likely to heap even more CO2 on the burden. What does this have to do with intermittency? A lot. The great advantage of biomass burning is its reliability—and even better, its versatility. It's dispatchable. Not as dispatchable as natural gas, but it can play a similar role. Sun not shining? Burn wood. Wind not blowing? Burn wood. Too much solar power? Don't burn wood, etc. Hydro is even more dispatchable. Thus Germany is dealing with Norway to import hydro, and to swap oversupply of German wind generation back to Norway. This is similar to the kind of trading already practiced between Denmark, Sweden, and Norway. In this situation Norway's and Sweden's hydro has become a necessity for Denmark—whereas for Sweden and Norway, use of Denmark's wind power is discretionary. It puts Sweden and Norway in the driver's seat, economically. This helps to explain why Denmark's electricity is the third most expensive in Europe in terms of purchasing power, after Germany and Spain. On the cost of electricity, both absolute and relative to purchasing power, look here. On the German deal with Norway, look here. 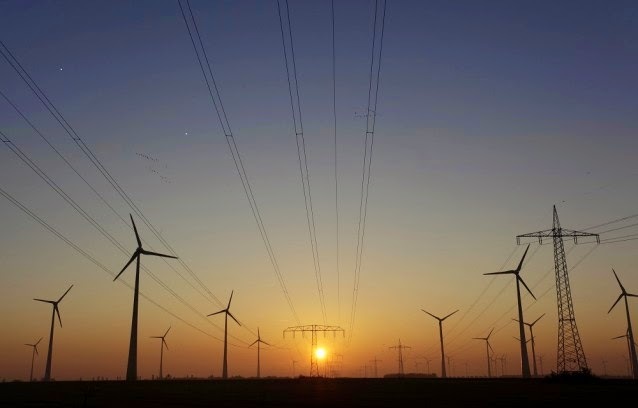 In terms of an overall strategy for electric power, Germany has been hedging its renewable bet. Germany has been ramping up biomass to substitute for fossil fuels, partly for baseload, and partly to cope with intermittency. It has been substituting one carbon-intensive energy source for another, with little more than speculation to support the claim of renewability for biomass. Suppose, by 2025, Germany could slash its fossil fuel consumption by 80 percent. Suppose it eliminated biomass burning for the reasons cited above. Suppose it completely axed its nuclear program. Suppose it could jack up its hydro by 50 percent. To keep total net generation at the 2012 level (576 terawatt-hours) Germany would then have to produce 382 terawatt hours a year from wind and direct solar—that's the shortfall from the 80% fossil fuel generation lost, the 100% nuclear generation lost, the 100% biomass burning lost, compensated for, in part, by the hydro gained. In 2012 Germany generated 46 TWh from wind and 28 TWh from solar, totaling 74 TWh. That means that in 13 years (2012-2025) we would have to multiply the 2012 contribution of wind and solar fivefold! Well, why not, given the rate of current progress? Here's where intermittency raises its most ugly head—the rock upon which the race to intermittent energy sources, carried too far, must trip and fall. As long as the contribution of the intermittent source is small in relation to the whole, intermittency matters little, since other sources take over when the intermittent source fails, or if the intermittent source generates an oversupply, the effects on voltage and frequency are small and can be cushioned by management of the grid using current practices—although in some cases that means dumping it altogether. The greater the fraction of power coming from intermittent sources, the greater the risk of instability, the greater the waste from power generated that cannot be used, and the higher the costs of the remedies. The intermittency dilemma helps to explain the recent grumbles of German economists, power experts, and politicians, questioning the workability of current policies. In large part this is due to costs, but increasing reliance on wind and solar threatens a more menacing problem than costs—that of feasibility. Hold that thought. In our next installments, we will consider ways of dealing with the feasibility issue, including ways that are already being practiced with varied success in places like Spain. Those potential solutions involve a mix of (1) choreographing inputs from various sources, both intermittent and otherwise, across a regional, national, and international network of users; (2) energy storage; (3) sustaining or ramping up nuclear as a way to handle baseload; (4) keeping coal in the picture, and employing Carbon Capture and Storage (or Sequestration), acronym CCS.. Meanwhile, for a theoretical analysis of the dilemma of intermittency, see this study made under the auspices of the Potsdam Institute for Climate Impact Research: here. Not only does it show a rolling 7-day output on the same scale as the other sources, a person can download all historical data captured in 5 minute increments going back years and analyze it with excel. About a year ago, I analyzed 6 months of data and discovered that the std deviation was greater than the average! The only reason wind output "works" in the BPA region is the easy backup from hydroelectric. Thx much for this; great resource. This is my third try at thanking you so I hope it takes effect. Seems to have been a problem with my browser settings--so I'm trying a different browser. Have you seen a reliable estimate of how much money Germany has spent on it's "renewable" energy program? Some of the estimates I have seen are high enough, that if Germany had spent the same money on building new nuclear electricity generators, they could now have zero CO2 emissions in their electricity generation sector. In other words, the money that has bought them less than 20% of their electricity in wind and solar (and a lot of biomass) could have bought them 100% CO2-free electricity (including leaving existing nuclear in place and counting old hydro). Thanks Todd. I'm glad to see the UBA numbers confirm mine (you never know when you might misplace a decimal point). The quote from Beate Braams represents a such a profound disconnect I wonder if she was quoted accurately. I wrote a long and on-topic comment. I went to preview it, and... it was destroyed. Eaten without a hint that it ever existed. I could not even recover it by going off-line and returning to the page on which I wrote it. It appears the code had some kind of new problem with threaded comments on certain browsers. This problem should now be solved. The only issue I am still seeing is if you are not logged in to your account, type out the comment, and choose "google" as your reply mechanism it will take you to login then not recapture the comment. So for all, please either login before posting the comment or choose Name/URL or anonymous, etc. Let us know if you still have issues via email! I think where you fellows are all going wrong with your focus on intermittency is that load pulsing or absorption does not have to be handled by batteries. Energy can be stored mechanically; the flywheel comes to mind. Picture a society where each house, each apartment block, has a flywheel in the basement. The user takes in the presumably-intermittent power and stores that in the flywheel, where the power sits, silently, awaiting call-out. The sky gets cloudy, whatever, and the power is in "intermittent" phase; so what? Who cares? The homeowner has his power sitting right there - in his flywheel. Assuming he is on LED lights and his freezer is already cold, that flywheel will keep him going for days or weeks (dependent on how much money he has thrown at it); when the sun shines again, the flywheel recharges. Tens of thousands of these flywheels interconnected will stabilize any grid system, and if they are not set to go to full storage in normal use, then if the event of a cascading line failure and power pulses, the flywheels can absorb that just fine. Best of all: flywheels don not exactly require the fabrication of chemical baths the way batteries do. I invite anybody here to debunk the flywheel concept. Been around for at least 5,000 years, so not as if there is a big learning curve on them. Fly wheels are far more expensive and complicated to implement than you might imagine. Here at MIT, a flywheel is used for the fusion tokamak reactor. According to this alternate energy blog, a rough estimate for a home flywheel is approximately a million dollars. http://physics.ucsd.edu/do-the-math/2011/09/got-storage-how-hard-can-it-be/ Even if he is off by an order of magnitude, that's a very high price (not to mention the economic prices of unreliable power to industries and economy in general) to forgo already cheap, clean, reliable, and energy dense nuclear. An article I'll be doing on storage is still in gestation. I briefly checked out flywheels a few months ago and plan to give them a serious treatment later, but the idea of home flywheels in basements having an impact on the grid is a nonstarter. Who's going to debunk the flywheel concept? Not me. Concepts are cheap. The concept of sending a man to the moon is more than a concept; it's been done. It took a long time, and cost a lot. For you and other flywheel enthusiasts, there's a link below referring you to a Sci Am article on a new design flywheel aimed at a small off-the-grid market, the brainchild of Bill Gray. In April 2013, when the article was written it was a design with no prototype built yet . As best as I can determine, only a small prototype has been built at this point. But let's take the claim for Bill Gray's flywheel at face value, for a home-installed device that might be brought to market by 2020. It has a 15 kw-hr capacity. The average household electricity use in the U.S. is 29 kw-hr per day. The cost of the device is $1,333 per kw (an estimate since even a full-sized prototype has not been built). It takes 5 hours to charge, so the cost of just the device is a minimum of 5 x $1,333 = $6,665. Unless you're a good electrician, you will probably pay $500-$1,000 to get it wired into your home system. Not affordable for a lot of people, even given a tax credit which involves the public paying for it. They might not be able to loan out enough money for the rest of us poor schmucks to create this network you're talking about. Again, we are taking the designer's projections at face value. How many homes have a basement? I don't. How many people even live in houses that could have a basement? I don't know, but I'm guessing that a majority of U.S. citizens either live in apartment buildings or houses without basements or basements that are cluttered with too much stuff to add even a refrigerator-sized flywheel. If you rent (which more and more people do) and have a basement, you have to persuade your landlord to put $6-7,000 into a system for your home with his/her incentives being about nil. What about hospitals? What about shopping malls? What about airports? What about emergency services (firehouses, police stations etc.)? What about office buildings? In short, your *concept* of numerous residential flywheels has a snowball's chance in hell of being implemented within the next 50 years, a time-frame where gazillions of tons of CO2 will get pumped into the atmosphere, since wasting resources on unreliable generators leaves us dependent on business-as-usual. Let's pray that CCS actually works. If flywheels are going to work for a large grid, they will have to be installed at industrial scale and paid for by big businesses. That's why Gray's startup market is projected to be off-the-grid systems. At this point, most of the grid systems I've heard of are getaway homes, and I doubt most of them have basements. A bunch of misinformation and misleading claims in this article. - Sweden/Norway hydro is not essential for Denmark, it is an economical decision. They could generate 100% of their power from domestic cogeneration plants if they wanted, but they chose to import if Sweden/Norway offer low enough prices. They also dump their excess wind power into district heating systems, if prices are negative. - Germany's energiewende goal is not reduction of carbon emissions, but a transformation of energy system to renewable energy. Reduction of carbon emissions in the long term is only a side effect. - biomass is an issue, that's why new version of energiewende limits biomass to 100MW new annual capacity, in contrast to 2-2.5GW for solar and 2-3GW for wind. - storage is not needed until about 60-80% renewables, so there's a long way before this becomes an issue. In the mean time it's cheaper to expand grids, build overcapacity and dump excess power into district heating systems. - there is no 'grumble' about feasibility of energiewende. The only party that dared to question it has been kicked out of the parliament on recent elections. If anything the vast majority of public wants it to happen faster. I'll take your second point first as the most significant. "Reduction of carbon emissions in the long term is only a side effect." Only a side effect!?! And here I thought the Germans were concerned about Anthropogenic Global Warming. Apparently not. Apparently their enthusiasm for renewable energy is such that they're willing to sacrifice the health of the planet in order to satisfy their pride in developing renewable energy. If so, they have many allies among the legions of renewable energy enthusiasts. To take another baseball analogy, it's as if a team goes into the season with the objective of producing the most home runs rather than the most wins. As far as I'm concerned, when it comes to AGW it's wins that count, rather than strutting numbers of kilowatt hours from renewable energy. The prospective losses are sickening. As to your first point, the assertion that the trading with Sweden and Norway is an "economical decision," I have to wonder about the wisdom of that decision since Denmark has the third highest electrical energy costs in Europe (maybe first or second, depending on how you assess costs in sheer dollars or in purchasing power). Like, huh? I would call that a dependency on Norway's and Sweden's hydro. As for what cogeneration Denmark has actually developed that they could switch on when they turn the hydroelectric switch off, I would like to know the numbers. Do you have them? "Germany has a stronger economy than France." Apparently this is a valid excuse for emitting more than twice as much CO2 per capita as France in electrical generation (not even counting biomass burning). Is the average German more than twice as productive as a French citizen? Talking about questionable decisions, capping biomass generation along with closing nuclear power plants will leave them with even less dispatchable power. Unless, of course, they increase their dependence on imported hydro, for which there must be some limit. As for "dump[ing] excess power into district heating systems"—what? Does Germany not have a summer? Summer, in which solar power is most abundant. Heat is in demand in the winter, a time when solar, in Germany, is in the cellar. OK, you substitute wind, if it has be blowing in the right place at the right time. That means you have paid both for overcapacity of wind (not so much needed in summer) and overcapacity of solar (not so much needed, or even available, in winter). Your fifth point on storage vs market penetration: I have seen no credible study showing that storage is not needed until 60% penetration, much less 80%. Did you read the Potsdam paper I gave a link to at the end of my piece? Perhaps you did, and are not persuaded by a mere economic argument. How much over the price of energy in other countries is Germany willing to go? 20%? 40%? 50%? You may argue with some of the assumptions and calculations in that report, but for its conclusions to be off by a factor of three or more is incomprehensible. If you consider yourself more expert on the energy picture in Germany than its own energy minister, then I would like to hear more about your credentials, other than that your handle is "ppp251". If the public is begging for continuance of the Energiewende, then the public is a fool. - there is no 'grumble' about feasibility of energiewende. The only party that dared to question energiewende has been kicked out of the parliament on recent elections. If anything the vast majority of public wants it to happen faster. I would rather analyze energiewende as a useful data source for why nuclear is important to fix climate change, since it does work (albeit at a high cost). Better have rich Germany do that insane experiment than my own country. They have the money. Of course I would rather the German's kept all BWR/PWR they shutdown in operation. I hope by 2100 50% of our total energy demands will come from unreliable solar+wind+biomass, but that the remaining 50% will come from reliable nuclear+hydro+geothermal. What matters is getting rid of 100% of fossil fuels long term. We need to spread this information as quickly as possible. Most anti nuke types swear that Frances electricity is cheaper than Germany strictly due to France's unfair nuclear subsidies... I think it has more to do with France extreme standardization of their nuclear fleet and the lack of anti nuclear insanity back when France was mass deploying nuclear. I would love to find articles that explain this in detail and deconstruct the anti nuclear argument. I often challenge people on the web that until Germany's retail electricity is cheaper than France's, energiewende won't be a success. Help us prove that France's nuclear electricity might be more expensive than natural gas or coal, but that it is cheaper than solar+wind without subsidies, please !